Tue., June 19, 2018, 1:50 p.m.
BUFFALO, N.Y. – Former defenseman Mike Weber is all too familiar with the Sabres’ lean years while spending a majority of his eight NHL seasons in Buffalo. And then there was the so-called “tank season” in 2014-15, when Sabres fans openly rooted for the team to finish last for the right to draft either now-Oilers captain, Connor McDavid, or Buffalo’s eventual pick, Jack Eichel. As it happens, Weber also enjoyed a glimpse into what could well be the Sabres’ more promising future following an eight-week stint with Frolunda, Sweden, last fall. 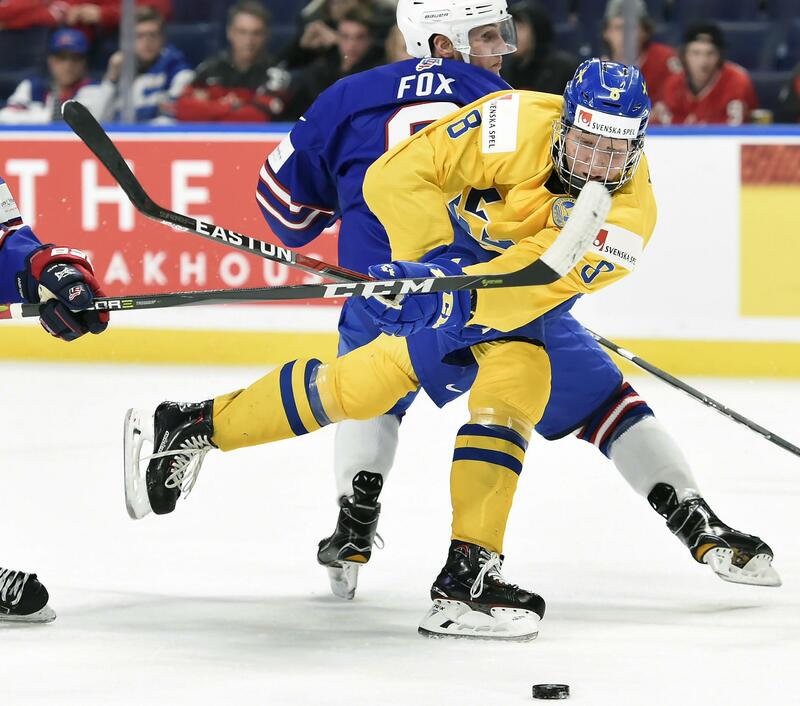 Weber had an opportunity to play alongside defenseman Rasmus Dahlin , the highly touted 18-year-old projected to be selected by Buffalo with the No. 1 pick in the NHL draft on Friday night. “I really, truly believe you guys are going to be getting a once-in-a-lifetime kind of talent,” said Weber, now an assistant coach with Windsor of the Ontario Hockey League. Though “suffering” might be overly dramatic, it resonates in Buffalo because that’s the word former general manager Darcy Regier repeated numerous times during an end-of-season news conference in April 2013 where he braced fans for a top-to-bottom roster overhaul. The team has not topped 35 wins in each of the past five years. And forward Ryan O’Reilly closed last season by suggesting a losing culture has crept into the locker room. Dahlin has the potential of injecting hope in Buffalo with his exceptional skating and play-making abilities. Weber compares Dahlin’s speed to that of Senators captain Erik Karlsson, and shiftiness to former Red Wings star forward Pavel Datsyuk. That’s what Sabres fans refer to July 1, 2007, when Buffalo lost co-captains Chris Drury and Daniel Briere in free agency. Days later, rather than losing yet another star, the Sabres matched the Oilers’ qualifying offer to Thomas Vanek by re-signing the forward to a seven-year, $50 million contract. Buffalo has not won a playoff series since. Former GM Tim Murray’s most significant trade in his rebuilding plan came on Feb. 11, 2015. He dealt defenseman Tyler Myers, forwards Drew Stafford, Joel Armia and Brendan Lemieux and a first-round pick to Winnipeg to acquire forward Evander Kane, defenseman Zach Bogosian and prospect goalie Jason Kasdorf. Kane is now in San Jose. Kasdorf played just one game in Buffalo. Bogosian has combined to miss 108 games due to an assortment of injuries over the past three seasons. Of the 15 players selected by Buffalo in the 2010 and `11 drafts, only four made the NHL and combined to play 144 career games for Buffalo. Of the 23 players Buffalo drafted from 2005-’07, only nine played in the NHL and none topped 400 games. Aside from losing the NHL draft lottery after finishing last in both 2014 and `15, the Sabres lost out to Toronto in the Mike Babcock coaching sweepstakes in May 2015. The Sabres thought they were closing in on a deal before Babcock announced he was going to take an extra day to reconsider. Babcock signed with Toronto and the Sabres hired Dan Bylsma, who was fired after two seasons. In finishing last in 2013-14, Buffalo scored 150 goals, the fewest in the NHL’s post-expansion era. The following season, the Sabres scored 153 goals and were shut out a franchise-worst 14 times. This past year, the Sabres won 11 home games, matching their fewest in any season. Published: June 19, 2018, 1:50 p.m.